The collapsed bridge on NH 37. 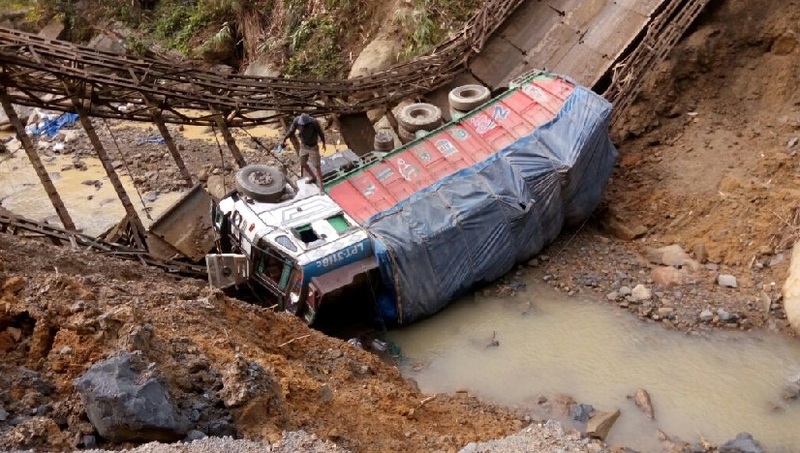 As an old bridge in Tamenglong district on the National Highway 37 in the Imphal-Jiribam sector collapsed on Sunday, the vehicular traffic on the route in Manipur has been affected. The Imphal-Jiribam sector is considered as the second lifeline of Manipur after the Imphal-Mao sector of NH 2. The NH 37 connects Manipur with the rest of the country via Silchar in south Assam while NH 2 connects the State with the rest of the country via Dimapur in Nagaland. The bridge, located at Nungdolan near Sibilong village, about 150 km west of Imphal under Tousem Police Station, collapsed when a 10-wheeler rice-laden truck (with registration No NL-03A-4308) was passing over it at around8.30 am, police sources said. Police sources added that the structure was in a fragile condition since the last few days and the reconstruction programme was already scheduled. The driver of the ill-fated truck, Michael alias Bikas from Manipur’s Bishnupur district and the handyman, who sustained injuries, have been admitted to the Community Health Centre at Nungba under Noney district, for treatment, the sources further said. This has left around 5 goods-laden trucks coming from Jiribam town towards Imphal stranded, police sources added. However, the light motor vehicles and empty trucks coming from Imphal continue to move towards Jiribam using a temporary bypass road which has currently been repaired in a war-footing. The goods-laden trucks can move in the important route once the repair work of the bypass road is completed within a day or two, the official added. Otherwise, reconstruction work of the old bridge will take time.